It may come as a surprise to most that the center of Hawaii’s exploding craft beer scene is not on Oahu, but on Maui and the Big Island. With 3 active breweries and a thriving local bar scene, the Big Island is leading the way for Hawaii’s craft beer revolution. At the forefront of the bar scene is Humpy’s Kona, lead by General Manager Bill Carl. An East Coast transplant, Bill has helped build Humpy’s into a craft beer destination in Kona that regularly features some of Hawaii’s best beer lineups and one of a kind local beers. I got a chance to chat with Bill about Hawaii’s emerging craft beer scene and local breweries. I am originally from Pittsburgh, PA and moved to Kona 5 years ago. How did you end up in Kona and at Humpy’s? I planned on moving here with some friends from a brewery, and I am the lone one left. Before working at Humpy’s, I was bartending at Huggo’s here on Ali’i Dr and before that was the Bar Manager at Lazlo’s Brewery and Grill in Lincoln, NE. When I heard that a craft beer bar was opening in Kona, I hopped at the chance to work with beer again! I started out as a bartender/bar manager and move up to become the General Manager, but still order all of the beer and make decisions about what goes on draught. We have been mentioned in DRAFT Magazine’s top 100 Beer Bars 2 of the 3 years that we have been open. We may have piggy backed on our Alaska location, but our name is in there. When did you first get into beer? Do you remember the first craft beer that got you hooked? Great question. I guess I’ve always been into beer, although I didn’t realize it. Where I grew up in SW Pennsylvania almost everyone drank what was local. I can remember walking in to the local bar with my Dad and seeing bottles of Latrobe’s Rolling Rock, Pittsburgh’s Iron City, or Pottsville’s Yuengling in front of the patrons. It wasn’t until I moved to the Mid-West for college where you wouldn’t see anyone drinking anything other than Bud Light or Coors Light. It really boggled my mind that there wasn’t a ‘local’ beer. I really wanted to drink something different in those early years, so I went straight to Old Style! Right around the turn of the century, which is weird to say, I went to the British Open at St. Andrew’s. While traveling around Britain before the tournament we visited a pub or two that really opened my eyes to the wonderful Old World styles of beer available and those amazing cask ales too. As soon as I arrived back in Nebraska, I was working in a brewery. To tell you the truth, I was already in the craft beer business when I decided that I never wanted to leave it. While working for Empryean Ales/Lazlo’s in Nebraska, they had the most wonderful beer education program for the staff there. I had no idea that beer was art and not just something that you drank while watching the Steelers. Learning the history and the nuances of each style is something that really spoke to me then and something that I try to pass on to my staff every single day. What is the most exciting thing about working in the craft beer industry in Hawaii right now? The craft beer industry in Hawaii right now just seems like a new frontier. We are always a little behind the times here and the beer industry is no different. Seeing all of the new breweries popping up around the State is awesome, and all of the interest in using local ingredients is something that will really set Hawaii’s craft apart from everything else on the market. It is such an exciting thing to be a part of! How are you and Humpy’s working with local breweries? We work with local breweries as much as we can. And not only local breweries but local brewer’s too! We are one of the very lucky bars in Hawaii that proudly carries Big Island Brewhaus beers. We keep one rotating handle on at all times and it has become our fastest moving product. When our local homebrewers have won awards and been able to do ‘Pro-Am’ beers we strive to have them on draught. We offered the Homebrew Association’s Gold medal winning IPA ‘Tsunami’ on draught in 2011 and then this year was able to offer Kimo’s Strong Scotch ale, which were both brewed by Maui Brewing Co and local homebrewers. This last month we held our 2nd Annual Big Island Beer Week where we featured a different local brewery every night, a beer dinner, and hosted the 18th Kona Homebrew Competition which had a record 300+ entries judged over 3 days. I won’t even get into the World Greatest Sausage Party we held during Oktoberfest. What innovative things do you see our local breweries doing unique to Hawaii? I have really been loving the collaboration brews from Maui Brewing and Big Island’s Red Sea of Cacao with pink peppercorns, Himalayan sea salt, imported chocolate, and molasses brewed with Caldera Brewing in Oregon. I am excited to see what interesting things will be coming from Big Island Brewhaus with their new 30bbl fermenters and the bottling lines. I was able to speak with brewers from new ventures on Kaua’i and Oahu and can’t wait to sample their beers. How do you decide what goes on tap at Humpy’s? I’ll put on anything new and exciting. Sometimes that works to our advantage and sometimes it fails miserably, but I will never stop trying to broaden the horizons of our guests and staff. I follow Twitter all the time to see what is being offered and what people are talking about. It is really difficult to get those beers to Hawaii sometimes, but I always try. I recently did a Sour Beer night with our good friends from Jolly Pumpkin Artisan Ales, that was just great. No one had ever done a Sour Beer night on this Island so I had no clue what to expect. So many good beer drinkers came out to revel in the Wild Ales and some of our regular customers who aren’t as heavy into beer were more than willing to give them a shot and were pleasantly surprised. Is there any beer or style that you always need to have on tap at Humpy’s? Of course IPA. IPA is our most popular style on the menu and the biggest category too. By far the best selling IPA, when we can get it, is Big Island Brewhaus Overboard IPA! Being so far away from the mainland US, is it hard to get distributors to bring in new breweries? I find that our distributors are more than willing to work very hard to get new Mainland beers over here. The issue that we come up with time after time is that the breweries themselves don’t trust that their beer will make it here unscathed. It is a very hot and expensive trip from Long Beach to Kawaihae and one that is very difficult on small breweries and delicate beer. I wish that we could see more beers from the Mainland, but if they are not going to make the trip in perfect condition than I totally understand the brewers reservations on sending it here. We’ll just have to keep making more ourselves! Do you see that getting easier and more breweries deciding to distribute to Hawaii in the future? I really do. It seems that almost everyday I am getting an email about a potential product that is thinking about making the trip. 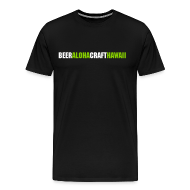 Hawai’i is a great place to market craft beers. We get travelers from all over the world who have only heard about the wonders of American craft beer. A lot of East Coasters love the flavors of the West Coast IPA’s, the Aussies can’t get enough of the full flavored US micros, and everyone from everywhere really enjoy seeing what types of beer the Hawai’i brewers are making. What breweries that are not currently distributed in Hawaii would you most like to see get here? Got a pen?? There are so many phenomenal breweries out there that would do so well here. I can never lie about wanting a taste of my native Yuengling again, but sitting down with a Dogfish 60 Minute IPA, or a Victory Prima Pils would be a dream come true. I’m not letting my East Coast bias slip out here, am I? You recently took the BJCP exam. Why? I really wanted to improve my beer knowledge. I have always been in the serving part of beer but never in the actual brewing aspect. Our local homebrew club was able to give an exam this year during Big Island Beer Week and I wanted to be a part of it. I wanted to learn as much as I could about the process of brewing and to be a part of the small Beer Judge community that provides feedback to homebrewers so that we can all enjoy more and better beer. Are you planning on taking the Cicerone exam? Do you feel it is important for more servers, bar owners, and people involved with craft beer in Hawaii to become Cicerone certified? I will be taking the Cicerone test in May. It was a dream come true to learn that the Cicerone will be taking place in Hawai’i and so soon after I just completed the BJCP exam. I think that it is very important to have all of the front of the house staff and most of the kitchen staff to become at least Beer Server certified. Every little bit that everyone can learn about proper serving practices and procedures will only enhance the guests experience. I cannot express how impressed I am that REAL a Gastropub has 100% of their staff Beer Server certified. That speaks so highly of their commitment to the craft. How do you decide what type of beer events and what breweries to work with at Humpy’s? I see so many different events going on through twitter all over the World that I want those events to happen here in Kona and in Hawai’i. Who doesn’t read about a Cask Ale Fest, Beer Bourbon & Bacon Fest, or the Lagunitas Circus and not want to be a part of it? I realize that not every event is going to be just like the ones on the Mainland, nor should they be, but we should have our own fests here that are just as unique and fun. I always try to work with the local breweries when possible. So many brews from the Mainland have a lot of money behind them, that’s how they can afford to be here. Our local breweries don’t have that kind of monetary backing and it is Humpy’s way of helping out their advertising. We are really proud of what Hawai’i produces and we want to showcase that whenever possible. Where do you see the Hawaii craft beer scene in five years? In the next five years, I can see Hawai’i emerging from a craft beer desert to a craft beer paradise. I already see new breweries popping up all over the State and I don’t want to see that go away. I can see the Kona Brewer’s Fest being better, I can see the Maui Brew Fest being bigger, I can see Festivals held in Hilo, Kaua’i, and especially Oahu. Most of all I would love to see homebrew competitions added to each festival to really celebrate how far our beer culture has emerged. The absolute most satisfying part of my job is being able to educate the staff and our guests about the wonderful world of beer. I love seeing that look on someone’s face when they learn something new, taste something new, or even smell something new. To me, there is no better gratification than when I can change someone’s preconceived notions or turn them on to something different. I’m one of those rare people who don’t have a favorite style of beer. It always depends on what we have new on draught at the Alehouse or what is interesting. We have a delicious Anderson Valley Heelch O’ Hops Double IPA on draught that I can not get enough of right now. But, if we could have a craft Pilsner full time, it would be hard not to have that, and I’m not even going to mention Great Lakes Edmund Fitzgerald Porter. This is a very good question. I would love to see the Brown Ale get more popularity, actually. Brown Ales seem like one of those gateway beers that doesn’t get the recognition that they deserve. It seems that a lot of people get their taste for craft beer through Brown Ales. Not too dark, not too hoppy, but just the right amount of roasty malt that goes perfectly with food. Once we get accustomed to Browns we move on to something with a big hoppy bite or a huge Imperial Stout and leave poor delicious Brown Ale in the dust. Hawaii’s tropical climate? Hmm, actually we have 11 of the 13 climate zones on this Island so it depends where I am. Here on dry, hot Alii Dr., a Pils or Golden Ale is hard to beat, yet in cool, damp Waimea I love to order the MaiBock, and in rainy Hilo, the English IPA is a perfect match for the weather. Cascadian Dark Ale or Black IPA? Once again, East Coast bias. Black IPA or American Dark Ale. There were Black IPAs being brewed in Vermont way before they were in the Cascade Mountains. 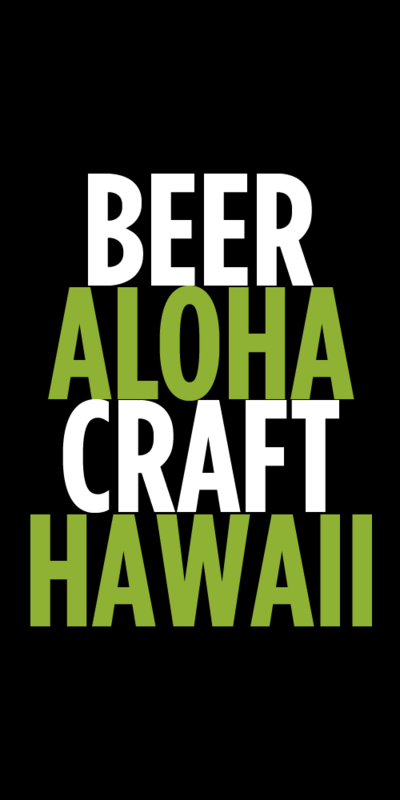 Tags: Big Island Brewhaus, Bill Carl, Hawaiian Beer, Humpy's Kona, Maui Brewing Company, Mehana Brewing, Real A Gastropub. Bookmark the permalink.